The possibility of getting skin cancer has been on my mind for some time. I have lots – lots – of mole, several quite big. They’re mostly on my back and seem to a have grown and multiplied imperceptibly over the years. Having moles and freckles is associated with a higher risk of getting skin cancer (although I’ve also read that having many moles is also connected to ageing more slowly – those of you who know me well won’t be surprised at that). It’s really about time I saw a dermatologist. Which is what I did a couple of weeks ago. On the Monday, I went to a hospital in Cheonan that was recommended by my boss, Soonchunhyang University Hospital. I went into one building and inquired after the 피부과, or skin clinic, and was directed to a neighbouring building. In the lobby there I spoke to a member of staff who spoke English and she explained that I should get a referral from another 피부과 first. I was given some directions and headed off there in a taxi. This skin clinic – 퀸 피부과, ‘Queen’ – was also a cosmetic surgery place. It was a bit rhinestoney – kind of down-market princess chic. My presence there seemed to be equally confusing to the staff and the female clients. But I took my T-shirt off for the doctor and he figured out want I wanted. Eventually, I was sent on my way with a piece of paper. I headed to a nearby Starbucks to do some work on one of my games. The following day, I went back to the hospital and saw a dermatologist there. He gave my torso a fairly cursory examination and said that they would take a biopsy from the darkest mole – or naevus – on my back. A younger man did the procedure. I lay on my front and he anaesthetised the area, used some device to punch a small hole in my back, then sewed it up with a couple of stitches. The sample was a little cone of skin a bit less than a centimetre tall and about half a centimetre across the base (the skin surface), pinkish-greyish-brownish in colour. I was told to keep it dry and was prescribed some medication and told to get iodine and waterproof plasters. I was to come back the following week to get the biopsy result and have the stitches out. The mole is a little to the left of my spine, but pretty much in the middle of my back. Not easy to reach oneself. However, with a little daily practice, I got fairly proficient at wiping the stitches with damp tissue, dabbing it with iodine and putting on a fresh plaster (the waterproof plasters were excellent – they have a slightly rigid plastic covering that keeps them straight when you’re putting them on, they really are waterproof, they don’t peel and they don’t leave much of a sticky residue behind). I took the medicine – antibiotics, I think – most of the time, but had a few left at the end of the seven days. The wound didn’t bother me at all. 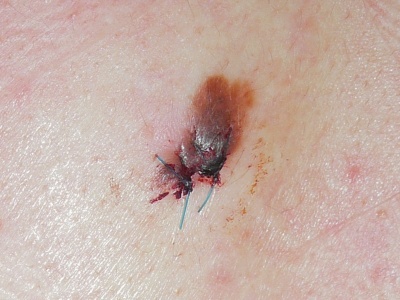 I went back the following Tuesday and the dermatologist told me the result was negative – there was no sign of cancer – in that mole, at any rate. I wonder whether some of my other moles ought to be tested, as well, just to make sure. I’m going to try to keep an eye on them – on the irregular ones, anyway. Having the stitches removed was quick and painless. I walked home feeling pretty good that I’d finally done the right thing, but conscious that it may not be the end of the story.